Sign up with your email address to receive our Clay, News, and a Letter emails! Thank you! You'll be in the loop on all the latest and greatest things happening in our clay studio! 6 Monday Evenings • 6:30 – 8:30 p.m.
6 Wednesday Mornings • 10:30 a.m. – 12:30 p.m. Course will guide you through the three basic techniques to hand building; pinching, coiling, and slab work. Projects will be student-driven under the instruction of John Guarnera. 6 Tuesday Afternoons • 2:30 – 4:30 p.m.
6 Wednesday Evenings • 6:30 – 8:30 p.m.
a refresher. Open to all skill levels. 6 Thursday Afternoons • 12:30 – 2:30 p.m.
6 Tuesday Evenings • 6:30 – 8:30 p.m.
Move beyond the basic techniques of throwing on the wheel. 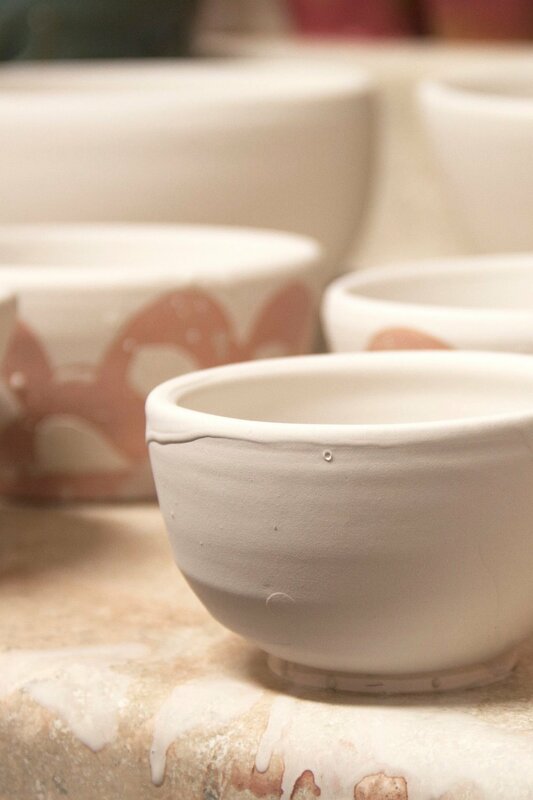 Refine your throwing skills and expand your range of forms through individual projects. The class will cover more advanced techniques in surface decoration and glazing. Get a (good) grip! Learn how to make pulled, coiled, & hollow handles for mugs, soup bowls, serving trays, and whatever else you’ve got to get a grip on! Learn how to measure and fit the perfect lid to your thrown vessel. From sugar jars to cookie jars, the skills you’ll learn will apply to all! In this class, students continue to discover the excitement of clay! Geared for beginners and those looking to expand their skills. In this class students will learn both basic techniques of wheel throwing, hand building and slip/glaze/wash application. possibilities of both leather hard assembly techniques as well as techniques of wet assembly with an emphasis on the possibilities of spontaneous composition in the wet assembled vessel. Fun “Make & Take” workshops—perfect fit for all skill levels and busy lives. Snacks & beverages are provided to enhance the fun experience. Platter by Sue Tirrell, inspiration for the class! Time: 10:30 a.m. – 12:30 p.m.
Scratch through the surface and learn the time-honored tradition of sgraffito! Each student will learn how to layer colored underglazes and slips to create beautiful images on a pre-cut tile. In Mexico, bright suns are symbols of positive values and energy. Make your own Mexican clay sun to hang in your garden. Workshop will be two sessions; the first session we’ll build a slab clay form over a plaster mold, the second session, you’ll use underglaze to design a colorful pattern on the face of your sun. Completed suns will be readyfor pick-up approximately 1 week after the 2nd class. class you will sculpt, decorate, and fashion your own unique piece of wearable art. You will create 3-4 pendants. Create 3 distinct pieces for your table, serving, or place setting. All materials are supplied, no experience required. Maureen Joyce is the director of ArtsLive and a member of the Pennsylvania Guild of Craftsmen living in Carlisle PA. She attended Carnegie Mellon University, University of Pittsburgh and currently studies at Harrisburg Area Community College. She teaches a variety of ceramic workshops at CALC to encourage participants to explore clay’s various possibilities. Make a mug or vase with a cute little face! Let Maureen show you how to make a mug that will put a smile on anyone’s mug! Create a ceramic lantern using a pre-thrown form. Maureen will show you how to cut out shapes to make a beautiful lantern. Students will select a glaze and Maureen will fire your piece and it will be ready for you to pick up in about a week after the class. All tools and materials are provided, no experience needed. Some tools used are sharp knives and adult supervision is needed for younger participants. Workshops meant for all levels of experience. Led by professional artists, these workshops focus on specific techniques in ceramics. Students will walk away with the skills necessary to apply these new techniques to their own studio practice. Learn how to use a primitive firing technique with contemporary design and surface techniques. This class requires that students bring bone dry pieces to prepare with Terra Sigillata and burnish. Class two will decorate pieces with various techniques with low fire glazes. The third session will be held at The Red Tomato Farm to complete final surface treatment and pit fire the pieces. Class will meet at The Red Tomato Farm to explore a multitude of firing techniques. Participants will provide their own bisque ware pieces to pit fire, barrel fire, Raku and Obavara firing will be completed as well. Each participant will bring a minimum of 6 pieces to experience each firing technique. Each student participant will receive an instruction sheet so that they bring work that will provide the best potential for each technique. Classes start at 7 p.m.
A fun night out at CALC. Class & materials fee includes all materials and instruction as well as bevvies and snacks. All skill levels welcome--our experienced potter will ensure that you’ll create a successful piece. Choose hand building or wheel throwing. Students may purchase a pottery tool kit ($25.00 + $1.50 tax) to be picked up on the first day of class or at Open Clay Studio. All skill levels, from beginner to large pots. Carlisle Arts Learning Center does not provide a cash refund for cancellation of art classes, unless the class is cancelled by CALC. In order to request a withdrawal from a class or workshop, students must contact CALC at least 5 days before the first class meeting. Students who request a withdrawal at least 5 days prior to the first meeting will receive a 90% tuition class credit. Students withdrawing fewer than 5 days from the first day of class are not eligible for a class credit.